Want to just pick up some smoked tuna dip, bring it back to your condo and snack on it with a bottle of wine on the balcony watching the sunset? Cardenas Seafood Market on the east side of Panama City Beach, and Buddy&apos;s Seafood Market on the west end are both great spots that will have you taking home loads of tuna dip. Be warned, though, Buddy&apos;s own disclaimer is on his website: Buddy&apos;s is not responsible for "tuna dip addiction". Prepared daily with fresh Yellow Fin tuna, and less mayonnaise for a thicker, tastier dip. If you are in the mood to sit by the beach and enjoy a casual lunch, Schooners is the place for you. Get your smoked tuna dip here topped with spices and paired with tortilla chips and jalapeños. Their tuna dip is rich and full of smoky flavor. For more information visit schooners.com. Shirts and shoes are not required! Chef Dee is credited for spreading the tuna dip love to customers for over 20 years. You can now order Dee&apos;s tuna dip online, and it is smoked to perfection, vacuumed sealed and cold shipped to your door! Now you can use this popular smoked tuna dip for sandwiches, snacks and salads at home. To order online, visit smokedtunadip.com. Looking for pub style food to satisfy your hunger? Patches Pub and grill is a fun place to grab your favorite beer, listen to live bands and feast on some smoked tuna dip. This appetizer is smoked on the patio bar with hickory chips for that extra earthy flavor. Served with flash fried tortilla chips, jalapeños and pico, it&apos;s guaranteed to not make it to the to-go box. For more information visit patchespub.com. If you&apos;re bringing the family out for dinner and want more than just seafood options, Salty Sue&apos;s offers barbeque, burgers, and steak as well. Start your family off with their "crowd pleasing favorite" smoked tuna dip. This appetizer is enough for the whole family to share, and is joined by crispy corn tortilla chips and jalapeños on the side. For more information visit saltysues.com. These are just a few among the many restaurants in PCB that can satisfy your smoked tuna dip craving! 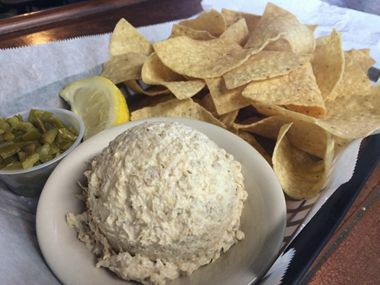 Where is your favorite place to feast on some delicious tuna dip?